After a few weeks, or maybe months, of driving here and there once in a while, I drop it almost completely. Months later, maybe even a year or more later, I think to myself “I should really get to work on that” and I do… for a few months, before dropping it again. I’m not sure what it is, but I just can’t commit myself to it. It’s not that I don’t want my license, but maybe I just don’t want it enough. Eventually, my learner’s permit actually expires, five years after I got it. So I have to, somewhat shamefully, drag myself back to the DMV, take that test again, and once again, I ace it. Here I am again – it’s 2014 at this point, I’m 23 years old now. I’ve got a full-time job, I’m a few years out of college, and I’ve once again got my permit. In the beginning, it’s much the same as before. I’m dedicated to learning how to drive, for a few weeks at least. And then, once again, I drop the ball. This happens a few more times over the years. Then I don’t get behind the wheel of a car for almost two years, and it’s no one’s fault but my own. Finally, it’s August 2017. I’m almost 27 years old at this point. My learner’s permit expires on my birthday in 2019, and it hits me. Do I really want to have to renew it AGAIN? I mean, god Melissa, it was bad enough that you had to renew it once all those years ago. This is just getting embarrassing. I think about what it would mean to get my license. I think about being able to buy a car someday; about having that sense of freedom. At this point, my life situation is a lot different than what it was back in 2009. I’m married and living with my husband, who has his own car. I’m still taking the bus every day to and from work, and anywhere else I want to go. And in the winter, when it gets dark early? Well, I’m pretty much stuck at home every night, unless I’m out with my husband. I think to myself: I feel like a helpless child. Those are my worst nights, and I know I need to do something about it. Classes started back in mid-September. For two months, I spent every Tuesday night, from 6-9 p.m., in a classroom out in Amherst, with eight teenagers and two other ‘adults’ who are both still at least four years my junior. 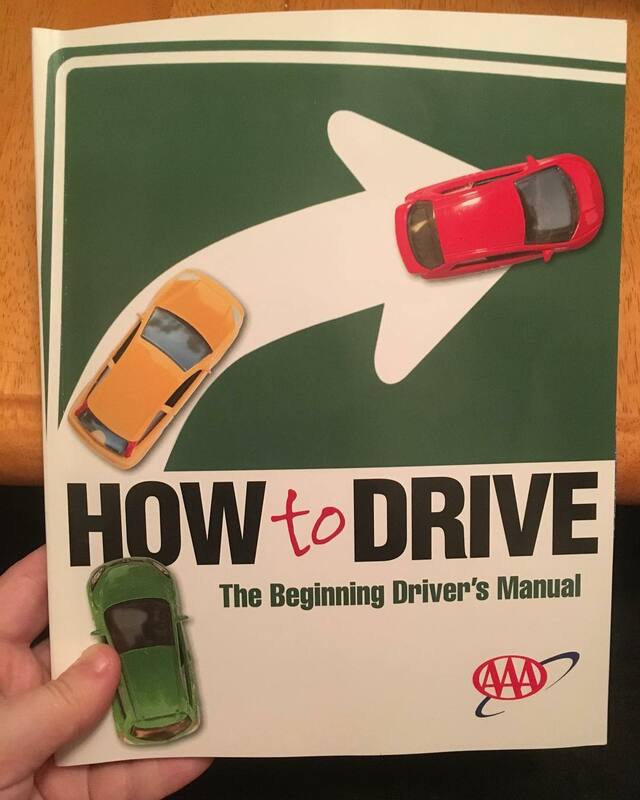 We read a textbook filled with information from the basic parts of a car, to getting ready to drive, to the most basic maneuvers. We learned about turning, braking, all that jazz. We learned about the effects of drugs and alcohol, drowsiness, and the like. There was a midterm, and a final exam, both of which were filled with multiple-choice questions. I paid attention in class, did my readings, and did pretty well on both. The classroom portion also includes the state-mandated five-hour course, which I took on Halloween. It was painfully long, but I knew I needed this to get my license, and I was happy to have it included in the License to Learn program. Alongside the classroom portion, I received real, in-car driving lessons from a AAA instructor. These were weekly, 45-minute lessons. My instructor picked me up from home (though you get a discount if you meet them at a AAA location) or sometimes even from work, and it worked out well. From driving on streets and side streets around Buffalo, Kenmore and Tonawanda, to practicing parking (including parallel)… it covered a little bit of everything, and gave me a set time each week to focus on driving. Oh, and I’ll never forget the first time my instructor said “Okay, we’re getting on the highway now.” Internally, I freaked out – I’d never driven on a highway before – but I survived! In between lessons with my instructor, I made sure to get behind the wheel at least weekly with my husband. Between all of this, I really noticed the difference, particularly in my anxiety. As time went on, I wasn’t an anxious mess getting behind the wheel. I began to feel more confident, and it made a huge difference. The last lesson of my in-car instruction included a 15-minute practice road test. I had to do a little bit of everything, just like a real road test, and my instructor took off just a few points. My AAA lessons ended in late November, and once I got home from my last lesson, I immediately went online to schedule my road test. I’d initially planned to wait until spring to try for it, as I didn’t want to try in the winter, but was discouraged from this by several people who said I should do it while everything was fresh in my head, and while my skills were at their best. The earliest date I could book: Friday, December 29, 2017, in Tonawanda, NY. The day finally comes. I’m nervous as all hell, but thankfully, the test is first thing in the morning. We arrive at the site & there are a few cars before me. Finally, the time comes. It’s all come down to this.